Crohn's disease causes chronic inflammation of the gastrointestinal tract. While many people experience weight loss as a symptom of the disease, Crohn's produces different symptoms in different people. 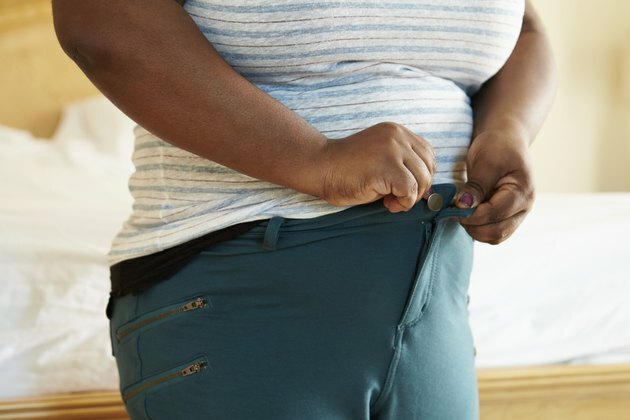 Because of the effect Crohn's has on the digestive system, losing weight may be more difficult and more risky in those with the disease than in the general population. Severe cases may prevent absorption of sufficient vitamins and minerals to ensure adequate nutrition. This makes it essential that the foods you eat are nutritionally rich and that you take all supplements as directed by your health care provider to prevent deficiency. Speak with your doctor before restricting your caloric intake. The Crohn's and Colitis Foundation of America states that Crohn's disease may increase your daily caloric needs beyond what is considered normal for a person of your age, weight and activity level. Limit the amount of sugar and saturated fat in your diet. In addition to helping with weight loss and improving your overall health, a diet low in fat and sugar may help slow the progression of Crohn's disease and minimize flare-ups. Include plenty of fruit and vegetables in your diet. These foods are usually low in calories, high in fiber and contain an abundance of important vitamins and other nutrients. A diet high in fruits and vegetables may also help ease Crohn's disease symptoms. Eat as much fiber as possible, unless it causes a worsening of your condition. Fiber can help you feel full longer because it takes a long time to digest, and high-fiber foods contain fewer calories per volume of food than low-fiber foods, according to MayoClinic.com. Substitute whole-wheat crackers for cookies, eat brown rice instead of white rice and opt for whole-grain bread instead of white processed bread. Prepare smaller amounts of food to prevent overeating, and opt for five or six small meals each day instead of three large meals. This will assist in weight loss and help prevent flare-ups of your disease. Exercise regularly, at least during periods when you are symptom-free. Exercise will not only help you lose weight; it can help relieve stress, which may help prevent flare-ups, and ease the depression that often accompanies the disease, according to the University of Maryland Medical Center. Speak with your doctor if you have concerns about the type of exercises safe for your overall health. Drink extra water during times of increase physical activity or exercise. Water helps prevent dehydration, and those with Crohn's disease are at increased risk of dehydration due to frequent diarrhea, explains the University of Maryland Medical Center. According to the Crohn's and Colitis Foundation of America, there is no reason to believe that certain foods cause Crohn's disease. Dietary changes may help promote healing and control symptoms once the disease develops. If you are restricting your diet in an attempt to lose weight, additional supplementation may be necessary to prevent deficiency. Is Okra Safe for People With IBS?